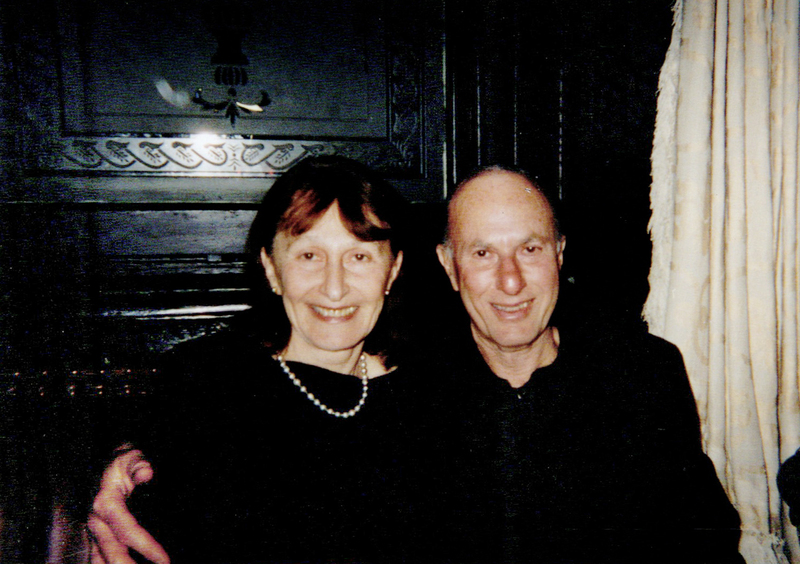 On December 6, 2014, we were pleased to offer the Collection of Elaine and the late Robert Dillof, of Croton Falls, New York. This was part of our 20th Century Art & Design auction in Chicago. Every so often we are reminded why we love the Arts and Crafts movement. 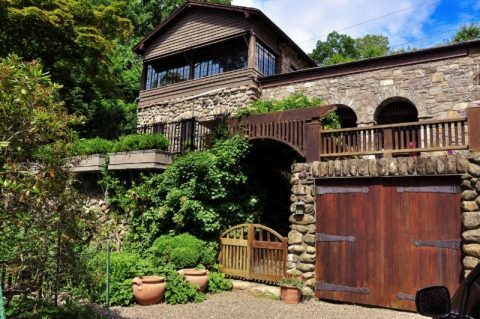 One of those times for me was the memorable day that I traveled to Croton Falls, New York for my first visit to the Dillof residence. From driving through the stone columns onto the picturesque property to the landscaping to the architectural beauty of the exterior of the house and finally the interior of the home itself. It was clear that Bob and Elaine Dillof had created a complete Arts and Crafts environment with attention to every detail. To begin with, this was no ordinary house. 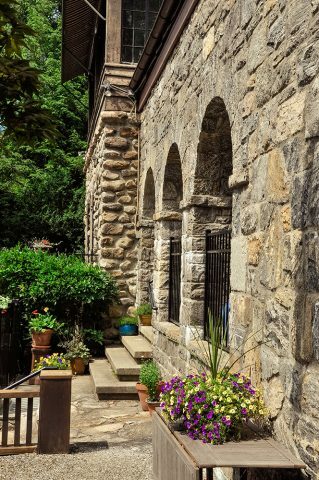 This stunning 1920s fieldstone structure is a former hunting lodge that had been altered and renovated and was the ideal setting for the Dillofs’ vision. The house was specifically chosen by Bob and Elaine to live with and display their Arts and Crafts collection. Theirs was a forty-year project that was ever evolving. They collected objects designed by many different artists and craftspeople. Elaine’s eye for design and her ability to integrate objects into a cohesive mix of colors and materials was remarkable. Elaine was always searching for more — she was known for relentlessly antiquing throughout New England and searching the shops and small auction houses in Maine and Upstate New York as well as buying from the major auction houses on the East Coast. She also was a bidder at our auctions when we had just the right thing. Bob and Elaine were regulars at the annual Grove Park Inn Conference as they were always seeking to expand their Arts and Crafts knowledge in addition to acquiring objects. And I’ll never forget seeing Elaine at the famous Allenwood “summer camp” auction in Vermont struggling with the dilemma of having bought too much to fit in her car. I helped her tie some of her purchases onto the roof of her car and off she went — she is amazing. Bob passed away in 2013 and all who knew Bob miss him. Elaine then made the tough decision to sell their wonderful house and important collection. She kept a couple of pieces she loved as a reminder of their collection as she moved into a new chapter in her life. Elaine has an undeniable eye for art and design. I can’t wait to see what she does next. Have you ever been asked if there’s a book that changed your life? Many well-read people undoubtedly have wished they could answer that question in the affirmative, but regrettably their minds cannot come up with a single title. I would like to be able to say the book was by John Ruskin or William Morris, but no, it was by George Grotz. The book was called The New Antiques, published by Doubleday in the late 1960s. In the preface, the author claims to tell “of the kind of furniture ordinary folk ever see and can afford to buy.” To explain why these words caught my attention, I should provide some background on myself. My husband, Robert, a dedicated corporate lawyer, and I, and our four young children were living in Rye, New York. Bob was prompting me to open an antique shop. He had three good reasons for doing so. First, I was trying to furnish our white elephant Colonial-style house (a relative from Mississippi once described it as “Tara, after the War”), and I had become addicted to going to tag sales and auctions and stopping at every antique store we drove by. Second, he knew that as a girl, I had spent many enthralled hours in the American Wing of the Brooklyn Museum and was drawn to old things. Third, he was aware that in the back of my mind I carried a little nugget of pride that after college, to my amazement, I had almost won a Winterthur Fellowship. Opening an antique shop meant, of course, I needed to become more knowledgeable about antiques. Having only a modest amount of money to invest in my business, I ruled out the 17th and 18th centuries as the way to go. The question on my mind that Bob and I often discussed at night was whether there was anything out there that was neither Golden Oak (glass ball and claw feet) nor forged Hitchcock chairs (pretty stencils), was of high quality, and was overlooked by the casual eye. This may have been my moment of epiphany. I put the book down and started to think. Was this what I was looking for? Mr. Grotz was an erudite writer. He had called Stickley important. Maybe there was some merit to this ugly furniture? After reading Grotz’s book, whenever I visited my usual haunts — second-hand furniture stores, wrecking yards, the Salvation Army — I looked out for Mission. I did not know yet that some pieces might be signed with the mark of the manufacturer. I did not know exactly what I was doing. What guided me was simply whether a piece appealed to me. Usually, it was the proportions and the grain of the wood. I began to see the furniture as quite beautiful. I decided not to bring it to the shop. I took it home. Eventually, I attended a series of lectures on antiques at S.U.N.Y. with Marvin Schwartz, who at the time wrote a column on antiques for the New York Times. He discussed Stickley. He used the term “Craftsman” instead of “Mission.” He spoke about a serious reform philosophy in aesthetics. He mentioned a paper label and a red decal. Imagine how my heart jumped when I turned over a table I had just bought for twenty-five dollars and found the words Als Ik Kan! I inspected other pieces and found the same words. I wanted to rush out of the house, get into my car, and scout the countryside for more Stickley. I was inflamed. I was hooked. Looking back, I realize that my response to the Arts and Crafts style of furniture was like the chemistry between two people who meet for the first time and know they have found the right one. I became committed to it. I knew I was going to furnish my home with it. Bob was as enthusiastic as I. He had fallen in love with it, too. The 1970s were an exhilarating time to be a collector. Treasures seemed everywhere. It was like being on the Big Rock Candy Mountain. Once I found a settle in the basement of a church. Another time a recliner in a gas station. In a florist shop, I found a bookcase — the doors had been taken off, but fortunately not discarded. I even found a Drugget rug in good condition on the street on a bulk pick-up day. One day at an auction at Christie’s, Bob and I were introduced to Stephen Gray. 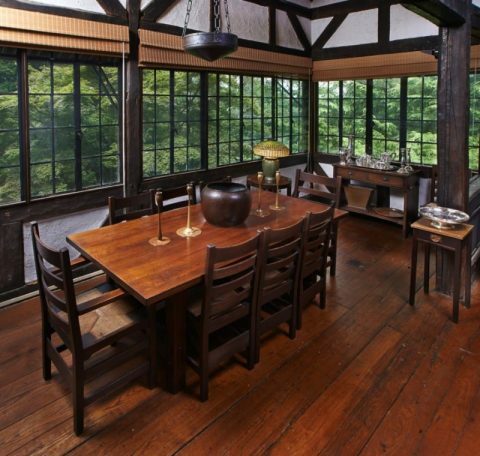 It was Steve who opened our eyes to the early work of Gustav Stickley. He became our mentor and very good friend. Under his guidance, we upgraded our collection. Of course money was always a factor. A lot of great pieces were beyond our reach. Luckily, there were dealers who allowed us to pay for things in installments. But we didn’t always aim for the rare or the iconic. Everyday, useful “homey things” were always in the picture — a tiled trivet to place under a hot casserole, a plain copper tray to serve the evening glass of wine, an embroidered pillow to throw on a bed or the back of a chair, and a silver bowl to place on the table for festive meals. Neither did we buy only Gustav Stickley furniture, but included in our collection exceptional pieces by other manufacturers. The house in Rye was modeled after Washington’s “Mount Vernon” home. When our children left the nest to attend college, we sold the house and sought to buy a house more compatible with our furnishings. 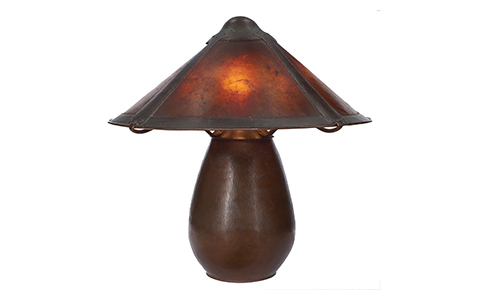 We hoped to find one that would more closely embrace the ideals of domestic living as expressed in the Arts and Crafts movement. We eventually found that house in Carmel, New York. The house was built of stone that came from the surrounding fields. It had a “great room” where people could gather in front of the fire. A wall of windows, with its view of pine and maple trees, connected the house to the outdoors. Most importantly, the house was in harmony with Gus’ furniture. I cannot express the joy Bob and I felt in the environment we created together. Every day we walked about our home, conscious of its beauty and distinction. 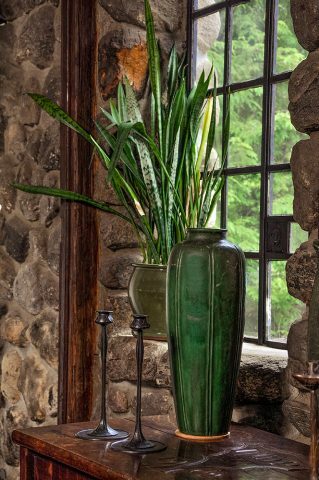 The pottery, copper, and woodblock prints that we added to our collection brought a soft palette of colors, akin to the colors of nature, into the house and complimented the dark, rich patina of the oak furniture. We lived with art, and our lives were elevated by it. At the end of the day, there is an emotional and spiritual element to collecting. Our hands run along the arms of a chair as a hundred years ago someone else’s hands rested there and did the same. It may be that the oil of our hands and theirs has seeped into the pores of the wood. The collector feels a visceral connection with the past and to the future, and on some level, by passing custody of our valued possessions to others and a younger generation, we feel we have made a link to eternity.